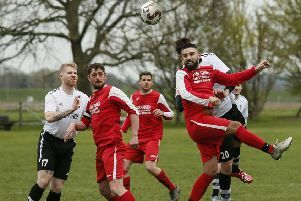 Ampthill Town earned themselves an early Christmas present when a second consecutive home win saw them move off the bottom of the SML Premier table and out of the basement for the first time this season. They beat Cockfosters 3-1 to follow up their win over Berkhamsted a fortnight ago and put their midweek defeat from Hertford behind them. Both sides had good openings early on with Stupple and Washington both having runs blocked after good work. Town broke the stalemate on the half hour when Sheldon Washington went on a mazy run following a corner and put Ampthill ahead. Ampthill had to work hard to preserve their lead in the second half and the visitors levelled in the 53rd minute when Ben Smaul found a way through Town’s defence to fire past Jack Ambler. But Ampthill fought back and after a quick counter attack Josh Murray restored the home lead. Town continued to make inroads into the away defence and they made sure of their success five minutes from time when Mike Draycott joined the attack to add the third. Ampthill have been resurgent since mid November and their improved performances and results have moved them out of the bottom two. They haven’t always had a settled side but their character has shone through and helped the cause. They go to AFC Dunstable on Saturday before three home games in a row next month beginning with the visit of Leverstock Green. >> Bedford romped to a 5-0 win at Chesham United Reserves in SML Division One on Saturday. Bamford bagged a brace for the visitors with further goals coming from Bradbury, Hunt and Kersey. The result leaves Bedford in third place, three points off the top but they have played three games more than leaders Wewlyn Garden City. They host Crawley Green on Saturday, December 27.